For the most part, the games I saw and played at the EB Games Expo were impressive. None really disappointed me or made me lose hope in a franchise. Some weren't for me, some made me want to pre-order that very same minute. But the one thing they all had in common is that none of them had a bizarre design decision that could potentially damage the experience for a large portion of the people playing it. All of that changed when I picked up a 3DS and started playing Kid Icarus: Uprising. I'll be honest. I have not played either of the previous Kid Icarus games. 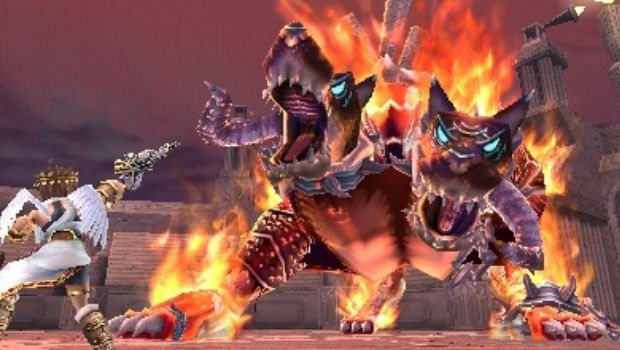 However, I'm well aware of some of the reverence that Nintendo fans have for the series and going into this demo I tried my best to disconnect myself from that, simply looking upon the third in the series as just another game. The Nintendo booth at the EB Games Expo was expansive with a heavy emphasis on the 3DS. Four handhelds were running Uprising and it had been busy most of the morning. When I finally grabbed it, I seemed to be the only one; the Mario Kart 7 demo drawing most people away. Protagonist Pit was already in the air. From a third-person perspective, the flight controls felt natural and easy with the 3DS' circle pad. Moving Pit through the sky was a breeze and when the floating enemies showed up, it was tons of fun to attack them through the clouds. The depth of the environments looked amazing in 3D. At this point, I was excited to play more. The backdrops of landmass far below Pit were incredibly detailed and with the 3D slider turned all the way on, they became real, tangible locations. 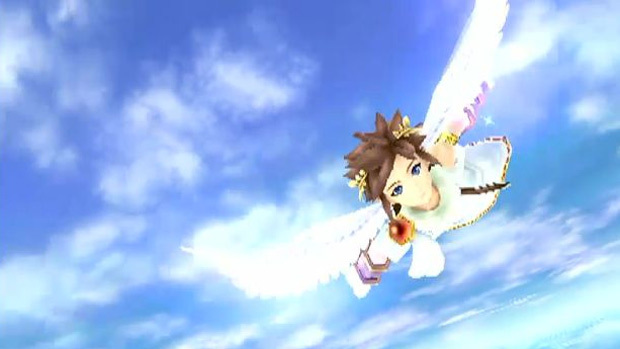 I was all the more surprised when Pit flew down in between buildings to fight some enemies on the ground. All the action took place on the top screen of the 3DS. The bottom screen was reserved for story-based text conversations between Pit and the goddess of light, Palutena. While in the air, a colossal Medusa appeared and I engaged in what seemed to be a short boss battle. Using Pit's barrel roll (yes, I did a barrel roll), I managed to avoid her attacks. While I was doing so, in the midst of battle, I glanced down to the bottom screen to notice story text scrolling past. Pit and Palutena were talking to each other. Granted, it was just encouragement from Palutena and energetic battle cries from Pit, but I completely missed it as I was too busy fighting Medusa. When the game took over control and landed Pit in a courtyard, the 3D once again shined. Tiny as they were, I noticed alleyways and balconies on the nearby buildings just before wave after wave of enemies headed my way. I could switch quite quickly between weapons, using a bow and a sword. When the enemies hit, the screen filled with attacks and I had to be constantly on the move. Sidestepping attacks and dishing out some of my own required pretty much all of my attention, otherwise Pit's life would be over. Halfway through the battle I glanced down to the bottom screen to see Pit and Palutena talking again. The text scrolled across the screen and I immediately realised I had again missed quite a large amount of what they were saying. The top screen during a battle afforded very little room for error and even glancing down for a few seconds proved costly. Now, I consider myself a relatively fast reader but there was a problem with trying to keep up with anything the two main characters were saying while I was getting bombarded with projectiles. This wasn't simply encouraging remarks I was missing anymore either, Palutena was relating story points and directions about the enemies (possibly improving my chances in battle). It was strange. I couldn't quite believe what I was seeing. The developers, Project Sora, had specifically inserted text on the bottom screen that was important to the story during a battle. Which seemed to be only time you couldn't really afford to look at it. I tried to be quicker in glancing at the text but then it became more about me fighting the game rather than Pit fighting monsters. Perhaps speed readers will have no trouble with this feature. They glance for a split-second, absorb all the information and then go right back to the action. I certainly couldn't manage it every time. And as far as I know, a large portion of the people buying Kid Icarus: Uprising will be kids. Kids who might not be able to keep up with the quick-paced conversations. Finishing the demo, I was confused. Was this feature present throughout the entire game? And if it was, how would that impact the story and the overall game as you progress through it? Sure, you can say "Story in a Kid Icarus game? Who cares?" but wouldn't it be preferable to know why you're fighting in the first place? And not just fighting to stay alive so you can read the story?